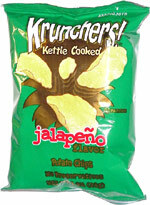 Taste test: These are kettle-cooked chips, not too bad, with a slight jalapeno taste. 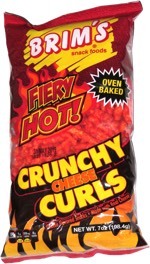 These aren't the hottest chips we've tried, and it takes a while before the jalapeno kicks in. I didn't reach for the water until after about 4 or 5 chips, unlike some others (Tim's) where you reach after a couple of chips. Smell test: Wow! A very strong jalapeno aroma comes up, and we were only opening the 1-oz. bag.